Today our bull Sam headed to his summer home in Penobscot, on the Blue Hill peninsula. For me, this is always a sign that summer has truly arrived. Our days are full of motion as we wake, eat and dress for a day out of doors. 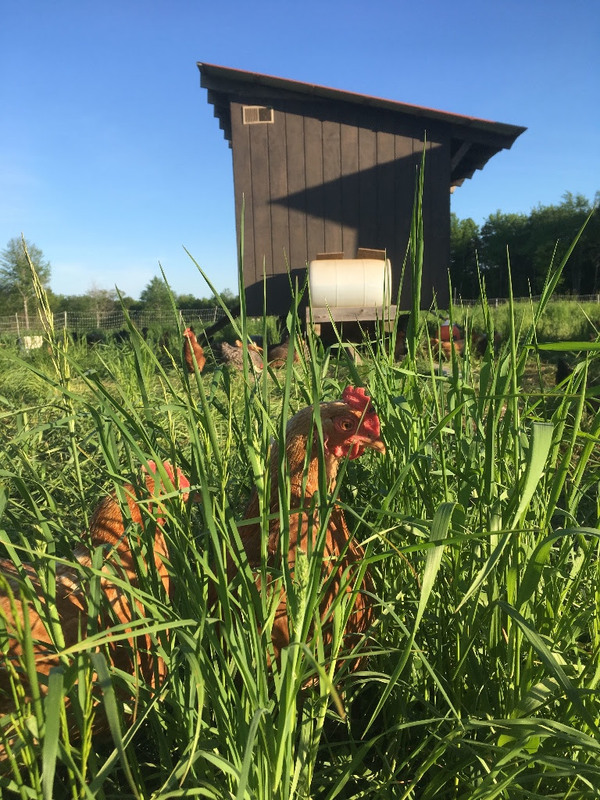 We are moving our broiler chickens to fresh grass each afternoon, our sheep to new pastures and our cows to fields where they are shrouded in green. Though we sell meat and eggs, we really raise grass. It is the key to what makes our meats delicious and sustainable. We frequently explain what we do with phrases like, “grass-based” or “rotational grazing,” and explain terms such as “organic matter,” or “carbon sequestering.” I often wonder how to explain what we do and why it’s so important. So, plan to come and visit the farm during our annual Open Farm Day on July 22nd and in the meantime check out this video that explains how grass based farming is helping to fight climate change. EGGS. Our new flock is laying really well and you’ll find plenty of eggs each week at market. I’ve explained what the heck a “pullet” is over on the blog. Chorizo Goat Sausage has returned. This loose sausage is made with a blend of organic spices from Gryffon Ridge Spice Merchants. FRESH chicken is available weekly on Fridays and Saturdays. We have whole birds, boneless breasts, wings and leg quarters. Look for Rosemary Mutton Sausage the last week of June. By the first week in July we’ll be restocked on beef and LAMB! Visit our Facebook page for updates. Since we turned on our walk-in freezer last month we’ve been talking about how to get it organized and you can help! We’re putting frozen chicken backs & geese on sale. Chicken backs include all white meat which make them ideal for chicken salad, tacos, pot pies or soups. Market price is $10 / pack (3-5 backs / pack) Freezer Sale price is $5 / pack! We have a few whole geese as well, now on sale for $6/lb. Delicious roast, smoked or grilled our pasture-raised geese make a delicious and memorable meal. To order, follow this link and enter the items you’d like as well as a market pick-up day. Outside 3 Days a Week! Thanks so much, we’ll see you at market!